Thomas F. Konop, Dean of the Hoynes College of Law was for many years a successful practitioner in the state of Wisconsin and was twice elected from the ninth district to the United States House of Representatives (1911–1917). 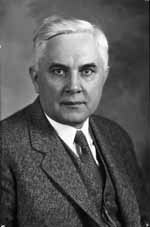 From 1917 to 1922 he was a member of the State Industrial Commission of Wisconsin and a member of the State Board of Vocational Education. Konop practiced law at Kewanee, Wisconsin where he served as district attorney for six years. In Green Bay, Wisconsin, he was a member of the firm of Konop and Diener, and at Milwaukee he was associate counsel of The Milwaukee Electric Light & Power Company.He earned the LL.B. at the University of Nebraska in 1904. The Konop Era 1923–1941, in A Century of Law at Notre Dame, Philip S. Moore C.S.C.